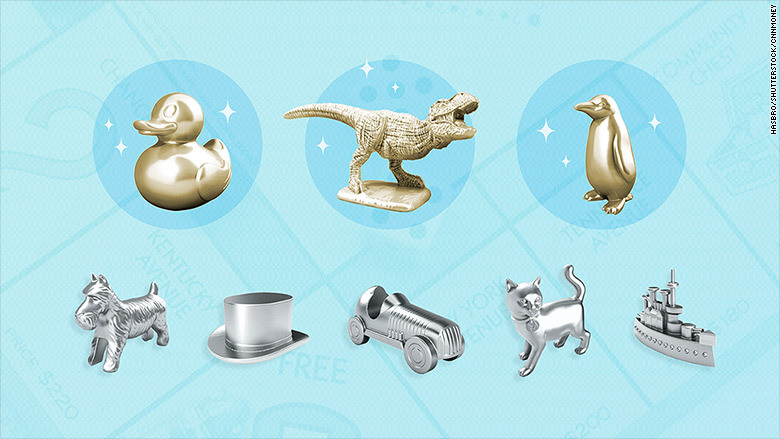 There's been a big shakeup in Monopoly's eight classic game pieces. Say goodbye to the boot, wheelbarrow and thimble tokens. The ouster of the classic trio is the result of an online vote Monopoly parent Hasbro (HAS) held in January at VoteMonopoly.com, marking the first time in Monopoly's 82-year history that Hasbro crowdsourced the future of the game. Voters were faced with a choice: Should Hasbro replace some -- or all -- of the traditional game pieces like the top hat and boot with more culturally relevant items like a hashtag, emoji or computer? 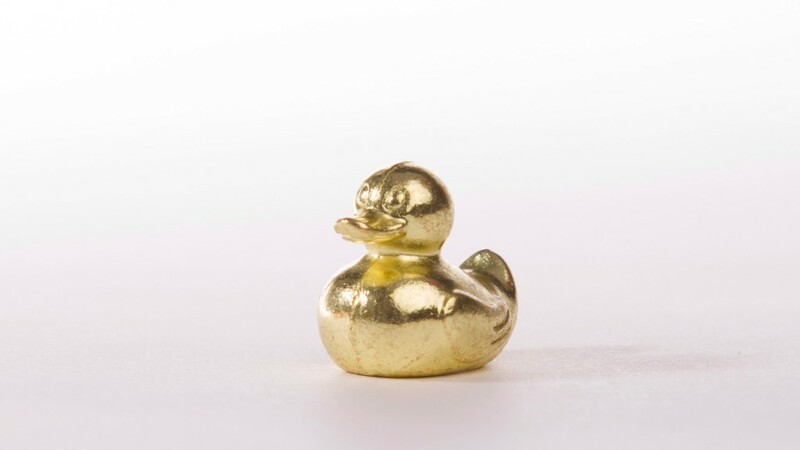 More than 4.3 million votes determined the newly configured group of eight: a T-Rex, rubber ducky and penguin will join the five classic tokens Scottie the dog, hat, car, cat and battleship. The boot, wheelbarrow and thimble won't appear in the game starting this fall. T-Rex, rubber ducky and penguin are the new Monopoly game pieces, replacing the classic boot, thimble and wheelbarrow tokens. "While we can't say why these exact tokens were chosen or who exactly chose them, we know they represent the voices of our fans -- young and old -- from around the world," said Jonathan Berkowitz, senior vice president of marketing for Hasbro Gaming. 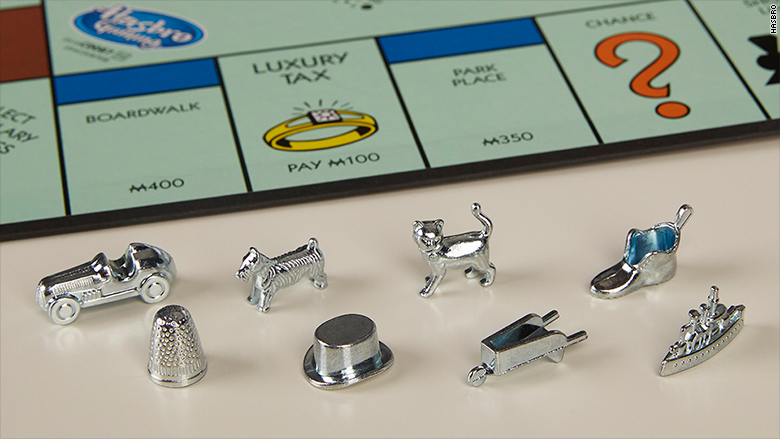 The classic 8 monopoly game pieces. "We saw a lot of passionate fans out there, including Singer Sewing Co., who rallied their fans on their social pages to keep the thimble token," said Berkowitz. Hardware chain Ace Hardware used social media to drum up support for the wheelbarrow. "I imagine that the thimble, boot, and wheelbarrow tokens don't resonate as much with today's fans," Berkowitz said.